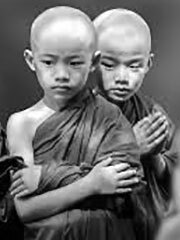 In Buddhist context, a samanera (also spelled shramanera) is a male novice monk who has devoted himself to a religious life and vowed to uphold the ten precepts. After a year or at the age of 20, he will be considered for the higher Bhikkhu ordination. Some monasteries will require people who want to ordain as a monk to be a novice for a set period of time, as a period of preparation and familiarization. Adults would normally wear the white robes of a Brahmin.